We are sandwich lovers in this house. I have never met one I wouldn't devour. I just love always trying new ideas and recipes to make one. Since I am always on the go and having to pack lunch for myself and everyone else sometimes making a healthy lunch isn't always an option until now! With no artificial ingredients and real quality taste, you can rely on Oscar Mayer Selects Natural to be one thing that’s not too good to be true. I love Oscar Mayer Selects Natural because it is made with no artificial ingredients, no artificial flavors, no artificial colors, no gluten and no by-products. And, it is minimally processed. This is all very important for myself and my family. With Oscar Mayer Selects Natural, you don’t need to give up the good stuff to enjoy the quality cold cuts your family deserves. If you are just making your favorite sandwich or you have a recipe that calls for cold cuts, you don’t need to give up the good stuff to enjoy the quality cold cuts your family deserves with Oscar Mayer Selects Natural. Let me just tell you this sandwich was the bomb! Absolutely delicious! I will be making it again and again! 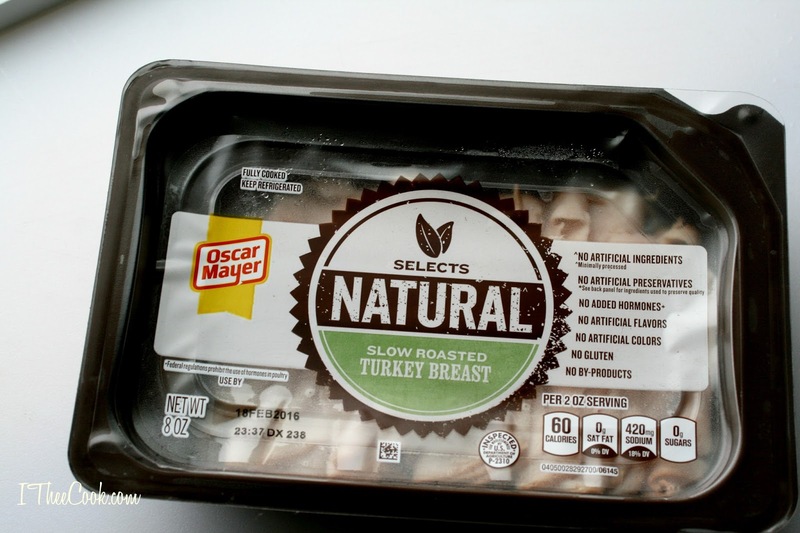 Oscar Mayer Selects Natural is available in five flavorful varieties including Slow Roasted Turkey, Applewood Smoked Turkey, Rotisserie Seasoned Chicken, Applewood Smoked Ham and Slow Roasted Roast Beef. You can learn more about Selects Natural and all the Oscar Mayer products on OscarMayer.com, Facebook at Facebook.com/OscarMayer, Twitter at @OscarMayer and on Tumblr at OscarMayer.Tumblr.com. In a small saucepan, bring the water, vinegar, sugar, salt and crushed red pepper to a boil. Transfer the brine to a large bowl and let cool to room temperature. Add the carrots and cucumber and cover to keep them submerged. Refrigerate the vegetables for at least 30 minutes and up to 3 days. 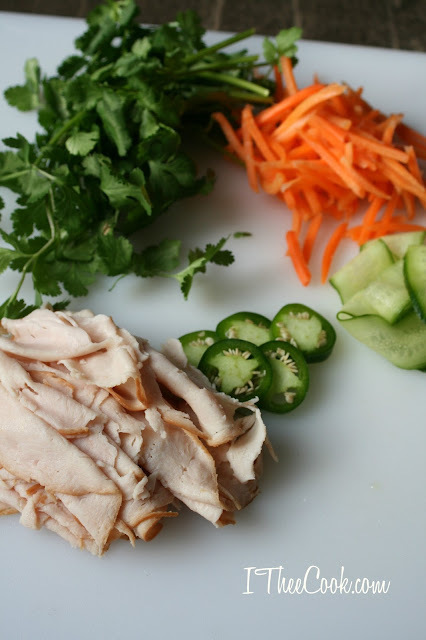 Whisk together the mayonnaise, Sriracha, lime juice, and garlic in a small bowl. Spread the bottom of the roll with the aioli. 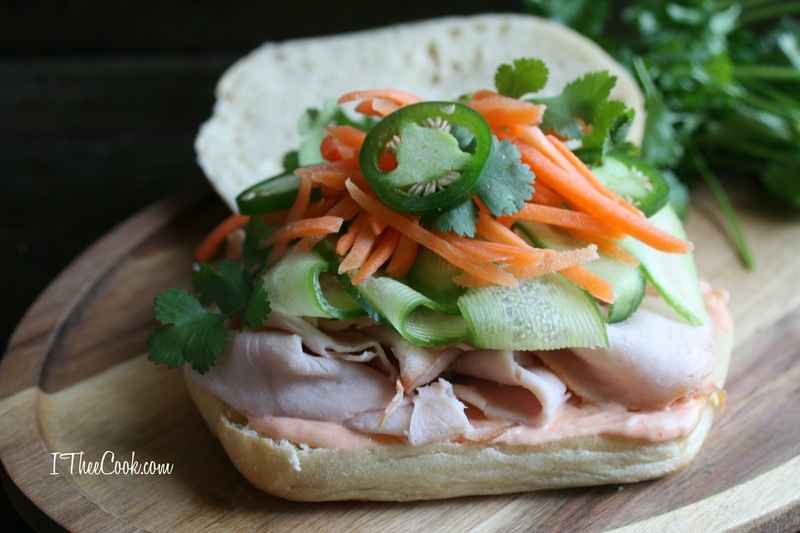 Place with the turkey on the bottom and top with pickled carrots, cucumber, and jalapeno. Close the sandwich and serve. *You will have left over vegetables and aioli. Store in the fridge and nibble on them later. Use the aioli for anything! Make sure to head here to learn more about Oscar Mayer Selects Natural. 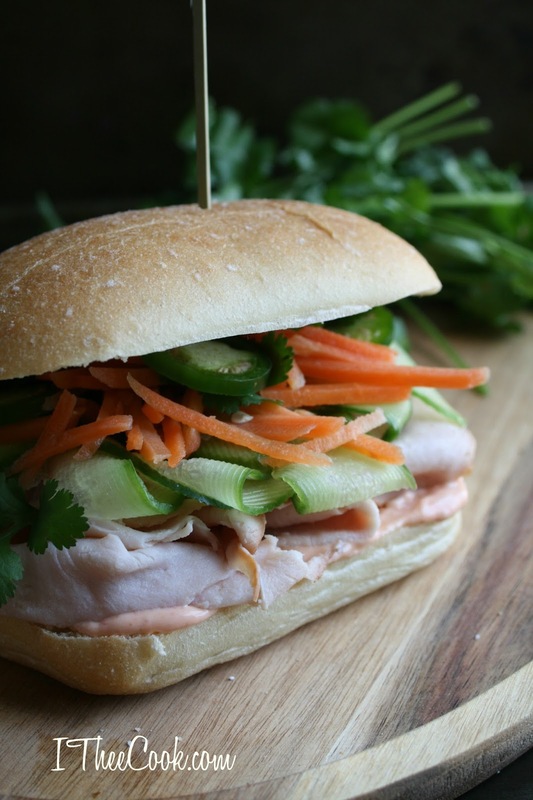 I love banh mi sandwiches and yours looks like a good one. What a gorgeous looking sandwich. I love that it's more than enough to fill you up, but without being too heavy. Thank you! It was totally filling in all the right ways. This sounds delicious! 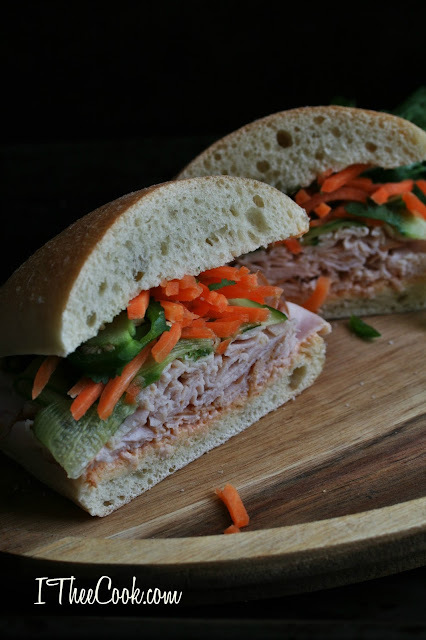 My husband and I love to make lunchmeat sandwiches for lunch on our days off together. This is one I want to try! The homemade aioli and pickled veggies sound so good. I love how simple and easy these look! I need to try this asaP! YUM! Those veggies look so fresh! And those thin cucumber ribbons... gorgeous! Thanks for sharing with the Wednesday Showcase! What a great sandwich! Hope you are having a great day and thanks so much for sharing with Full Plate Thursday.